How to increase search engine traffic without backlinks! →How to increase search engine traffic without backlinks! Search engines are important source of consistent targeted traffic. In general terms, the more traffic you get from Google and other search engines, the more you hit your target. However, getting this natural traffic is one of the most difficult tasks online. We know that to increase search engine traffic, backlinks (inbound links) are almost an inevitable requirement. Backlinks (natural dofollow inbound links) are an endorsement or a positive vote in favor of the linked page. Literally, the more backlinks (votes) your page gets the more its importance and usefulness to the readers. However, not all backlinks carry the same weight; the more the PageRank of the site linking to your blog, the heavier the backlink. That means a backlink from a PageRank 7 site is worth 10 and more links from PageRank 1 sites. 1 – Dofollow backlinks: These are positive votes that transfer link juice to your blog from the linking site. They have a positive impact on your SEO and can heavily improve your natural traffic. 2 – Nofollow Backlinks: These categories of back links don’t have any impact on your SEO. It’s another way for the site owner (of the site linking to yours) to tell search engines to ignore the links to your blog. The only advantage of this category of links is direct traffic. 3 – Dofollow backlinks from suspicious/Dangerous sites: While we scramble for dofollow backlinks, it’s negative to have such links from sites that are considered dangerous by Google. NB: Avoid dofollow links from dangerous sites. You can still get more traffic from search engines without be so worried about backlinks. How do I improve search engine ranking without backlinks ? I just established above that dofollow backlinks are a prerequisite to improve search results and get more traffic from Google and other search engines. However, there is an exception to the role. Let’s see how you can position your blog to get natural search traffic without worrying so much about inbound links. Shockingly, one of the reasons you don’t get more traffic from search engine is your focus on the keyword percentage of your articles. In the days past, this worked. Having a specific keyword spread within your content was a crucial onpage SEO factor. However, according to recent updates in the SEO industry, Search engines no longer deliver results that have an exact match to the query. Instead of repeating the same keyword, I recommend using semantically related key phrases. That is using a variety of keywords that are related. Search engines love in-depth content. As a matter of fact, it’s difficult for many bloggers these days to create content of less than 1000 words even if they are paid to do so. Developing your writing skills to be able to properly and effectively cover a subject in a single post is requirements to meet up with challenges in today’s changing SEO and improve organic search traffic. Now, here is the most important point to increase organic search engine traffic even without backlinks. The reason is that competition is often low and your content gets generally highly relevant. There may be few people hitting these queries on Google but combining a number of them can mount up to huge traffic to your blog. Look at that! This can help you take a short and highly competitive keyword to a long tail low competition key phrase. 2 – Image file size: You know your page load time is an important ranking factor right? That means heavy files will slow down your page speed, creating a negative impact on search ranking. I recommend using an image size optimization tool like Smushit.com to cleanup your images before use. Once again today i got a very useful post by you. To increase search engine traffic without backlinks is really strange to listen but after reading this informative and detailed article I knew that yeah it’s possible. Thanks for sharing, do have a nice weekend. Thanks for stopping by and adding your voice bro and happy weekend to you too. really helpful article i was learn many things thanks for sharing this i was also looking this type of article were is explain now i got it today here thanks…. Yeah, many bloggers says that doing KW research is more important and we should include a lot of Keywords in your post. I strongly disagree this concept and I won’t spent much time in doing and selecting KW research. As you told, I used to write in-depth posts for my readers and some synonyms of main KW. Hope am getting a decent traffic from search engines with these reasons and will follow your advice too. I never forget to do image optimization and compression of images, thanks for reminding this to other bloggers. Nirmala recently posted…Do You Have These 5 Important Pages On Your Blog? Those related keywords are called LSI keywords Enstine. A mixture of nofollow and dofollow will help you pass Google updates… but make sure dofollow comes from genuine sites otherwise you’re in big trouble. Hey Muki, very informative post with awesome tips and tricks especially with regard to back links and keywords. It’s like a bombshell for many newbies that keywords are no more as much important as they were a year ago. But I would differ on the point of lengthy of post. Like I have a green blog on tips and ideas. It does not need lengthy posts because its reader just want tips and that’s all. Yes for niches where inspirational topics work a lot really need lengthy posts to engage readers and convert them as subscribers and customers. Lengthy and indepth articles works great for me as well. I’m getting rank for most of my targeted keywords only because of ON-Page SEO. I don’t bother about building links. PS: The very first internal link (Check out this post) is giving a 404 error. Edit that link sir. Ankit Kumar Singla recently posted…StumbleUpon For Crazy Blog Traffic! Is it Really Possible? As you have said i am 100% agree with you. i never do keyword research . because i always like to write for my readers not to search engines . actually every blogger wants to drive huge traffic then he should read this post. as you have said write lengthy article it is great idea. 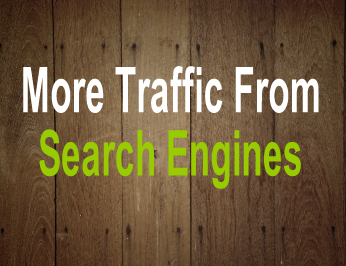 Don’t you think traffic from search engine is important too? Another great post to help us out! Keywording when you start blogging is very confusing. I know when I started I often pushed the limits of keyword percentages in my articles. Of course after doing this I saw decent results in serps. The problem became maintaining those serp results was a bust. I love the fact you suggest using auto complete. I often sit and write down long keyword phrases that I would use if I was asking for information in a non online conversation. It has worked well. Kudos for dispelling the common keyword SEO advice. Always you created very informative post. I think this is the best post ever you created because everybody knows that backlink is more impoetant for SEO but they don’t know about How to increase search engine traffic without backlinks All the information you have been provided in the article about How to increase search engine traffic without backlinks is very useful and hope that others will also benefit from this valuable knowledge. Really excellent ! Thank you for giving such type of nice article. Really excellent ! Very nice Article thanks for the post. Yeah I agree with you and these are the best rules to follow in order to increase blog traffic without Backlinks. Backlinks and dofollow and nofollow links are something that have always confused me. For example if someone shares my blog post or likes my blog post does that mean that now there is a backlink to my site from FB? And if so would this be a do follow or nofollow link? What about when you comment on other blogger’s post (e.g. like I am doing on yours). Does that me there is now a backlink from your site to mine and if so is it a dofollow or a nofollow link? My wordpress default on my settings is on nofollow. Should I be changing this to a dofollow? Why or why not? It’s all very confusing. First, sharing on social media does not affect backlinks. You get however social signals sent to search engines telling them how popular you are on social media. Commenting on blogs and dropping your url gives you backlinks. Some blogs have nofollow tag enabled while others don’t. With the increasing Google fight against people trying to manipulating ranking, it’s always a good thing to maintain the nofollow tag else Google may mistake you for selling links. That means you’ll receive a penalty strike. Oh also I never knew that longer articles are better for SEO. Is there a general rule of thumb on the word count. Are you suggesting 1000 words or more? I hate reading really long posts so I tend to write shorter posts. It’s a bit unfair if Google is penalizing me for this. I’ve been working on increasing the LSI keywords I use throughout my posts and I’ve been using Market Samurai quite a bit to do that. It’s amazing all of these hoops we have to jump through just to get ranked on search engines, isn’t it? I think at the end of the day though their end goal is that we just write great articles and forget about the SEO aspect. Tim Bonner recently posted…Is The Genesis Framework The Perfect WordPress Theme Framework? it is amazing and useful to increase the search engine traffic without baclinks and moreover this is a very creative work to do and this idea emphasis on the improvement of content in our blog post. this automatically will attract users and search engine too. very rightly said that Nofollow comments helps to save us from the Penalties from Google updates…. I figured that keyword density had lost significance about 6 months ago and promptly did away with both Yoast SEO and SEOPressor. Instead, I varied the keywords like you suggested and I discovered that the results were outstanding! Currently, Google is my number 1 traffic source. It seems most SEO plugins are yet to figure this out – for they are still sadly stressing density…too bad if you ask me. …and they shall inherit the blogosphere – not so, Enstine? Really landed first time on your site .Its very awesome site for learning from basics. bang on target!Traffic is key factor in blogging and you give very vital tips regarding search engine traffic,and in depth article is always play important role in seo. thank you for shring this great tips. hi muki. i love what you just posted. nice. i also make mistakes of stuffing my targeted keyword in my descriptions about 24-28 times which i think is the best way to rank high while i never know the don’ts and dominated by the do,s. will make some changes. nice regards.Android Terms Every Android User Must Know. I know that the longer the content the better for ranking, and my blog posts are basically always over 1000 words, and I’m trying to get more towards to 2000 whenever I can. It’s a good thing that keywords stuffing no longer works. I hated that and could never understand how in a world it could be OK for search engines. Yet it used to be. Remember those days? Image optimization is very important, indeed. Our post is also found by images. great advice, using keyword phrases instead of short keywords definatly helps you get noticed in teh search engines. I’m clueless when it comes to alt text. Thanks! Now here is the truth, I don’t do keywords before creating a post, and i certainly don’t put Google in mind when i am writing. Why? Because someday you might get affected in aone of their algorithm and you might have yourself to blame. Wonderful post and great case study, I thought backlinks plays a major role in getting or increase searching visibility. I’d try your tips soon. Yeah I agree with what you told in the article. It’s true that lengthy articles attracts a lot more attention for natural backlinks when compared to short article. The method to find the ltp keywords using Google itself is amazing. Thanks for it. Hello Estine! These is a Great guide! I agree with you about using LSI keywords. I personally use it in my blog posts. It increased my search traffic dramatically. And you taught me the way of finding the Long tail keywords by using Google Instant! Thank you for sharing such a wonderful info with us! Happy Blogging! Enstine Muki recently posted…DOFOLLOW BACKLINKS From PR8! Quick Steps Revealed! Great tips. I appreciate your suggestions…but i am curious to learn more that how Quora made its seo strong…as keywords will not works there. Thanks for sharing your totally excellent content! You really articulated the basic differences between no-follow and do-follow backlinks. Thanks! So when are you going to release your course on “how to” generate massive traffic to your site? Because you certainly are expert enough to teach beginners to advanced level marketers, on exactly what to do, in order to accomplish that ! Great content as always! Will definitely share it! Mark recently posted…How To Use Twitter For Business: Three Ways It Will Definitely Improve Your Copy! This really very helpful. Thanks Mr. Enstine Muki for writing some good tips for us. nice tips on how to drive traffic to a blog..
You definitely increase your blog traffic without backlinks though these method. If you use these method properly, You can definitely increase your search visibility. Nice tips and Thanks for sharing these important tips with us. yes, Image optimization is really very important. Keyword density also plays very crucial role. Adwords really help in finding keyword. These tips really gonna help many newbies. Great post, in fact quite interesting to read. I enjoyed reading this informative post. I am happy that you liked this post. Rahul This is really great method to increase search engine visibility through On-page seo. If you do proper On-page SEO, like keyword density, Image optimization etc. You can easily increase your traffic without single backlinks. You have covered all essentially things to increase search engine ranking. I am also using all these things to promote my blog. but most of post are under 500 words. I am trying to improve the length of post. I hope these tips will help me a lot to gain lots of traffic. Regardless of the time that my comment to this post is coming, I’ll really like to point out that the uniqueness and relevance of this article is helping many bloggers who are looking at building an authority online and as well bank on their effort. I’ve always thought backlink is the “alpha and omega” that makes a site rank. My worries for several months was not about how to get traffic to my site but how to get quality and long lasting backlinks to my site, but after reading this article, it dawned on me that organic traffic is the key. Dear Enstine, I liked this post. Reading and saving it for offline reading totally worth. If you don’t mind, I want to ask from you, How much time did you took to write this awesome post that really touched my heart? Thank You, sir, for this awesome article. Today, I have learned something new about to increase search engine traffic. We have to focus on quality content irrespective to working on building traffic. Back links has always been a huge probelm for me but with this post, I feel I could optimize my site more and getter better search engine traffic. If our page have Evergreen content, Amazing Title, Nice meta tags then Google consider our page as a rank. Internal linking is good idea to boost rank for the blog. Thanks Enstine Muki for lovely post. Thanks for sharing this definitive guide. Increasing traffic without backlinks is tough but not impossible. Such a awesome article. I have learned something new about to increase search engine traffic. We need to focus on quality content for increasing traffic.Now i am going to apply this strategy. Thanks for sharing great tips. Great and impressive article but I have a question for you, is this possible that we can get increased search engine traffic without back links? A great combination of old and new techniques. Some people criticize the classic submission techniques but never heard of them harming anyone. this one is very interesting and how to increase my website traffic via these ways. thanks a lot champ..! Great tips, thankyou for give me suggestion for Google’s auto-complete function to find a more searchable keyword its realy helpful to genrate more traffic to our blog i think its a great idea to take a keyword for our blog post and content. Nice and interesting post.Good points to be explored.Keep on going and good luck! you are right dear, it is an important factor to rise in the search engine. long tail keyword works now a day and you clear all my mind. thanks to share your knowledge. I find this post quite interesting Mr. Muki. Drive search traffic to your site WITHOUT linkbuilding you say? From my experiences, this has not been the case. Granted, my content may not have been as fully optimized as it could have been. And maybe the term(s) I chased were too competitive. It’s entirely possible. But traffic to a NEW Blog without any promotion? Well, I just dunno. Please don’t misunderstand me. I do know that it IS possible: in fact, I can reliably list two ways to make it happen. 1) Buy an aged domain (& check to see if the backlinks to the domain are still active) & publish unique, original content – just like you’ve mentioned. If you take care not to chase really competitive terms, you should be straight. 2) Post original content to a fully SEO’d site. What I mean by this is to optimize a site and secure powerful, high quality links to it. Once the site begins to rank strongly, then simply post content to it. If you have built (or acquired) a strong enough website, then any new content that you post will rank without any new links pointed to it. But I’ll have to try your method, my friend. There is no doubt that I’m always open to learning new methods! Before reading this post I was worried about creating backlinks because my thoughts are “If you need Traffic You Need backlinks” But now I am happy because indeed you can get decent amount of traffic through writing awesome contents. From today onward’s going to focus on my writing. Yeah, U have to think out of the box. Only then you can boost ur site. Keep experimenting with good research before. This is the most important thing. Having backlinks is important, but it’s not the most important part of SEO. Thanks, for the great article. SEO is the great factor for bringing blog and website. I have checked one blog with only few backlinks but that sites every post rank under 1-5 . How is it possible sir. Because all other blogs which are ranking 1 or 2 in serp those are having heavy numbers of backlinks. So without having much backlinks how can a blog or website rank on first page for every post. wasim recently posted..What is seo and why it is necessary?